UPDATE 5th August: there has been so much interest in this ride that we are going to do 2 groups with a maximum of 12 riders for each. Currently there are a maximum of 5 places left. One group, led by Katherine Boyce will catch the ferry at 0740. The second group will be led by John Tranter and leave at 0840. Katherine is setting up a Whatsapp group for the ride. If you have asked to go on the ride and haven't got whatsapp, Katherine will contact you with details of how to join. If you are joining after this date, Katherine will add you. Based on the ride that John Talbot did for many years, this uses what I think was the nicest of the rides he did. 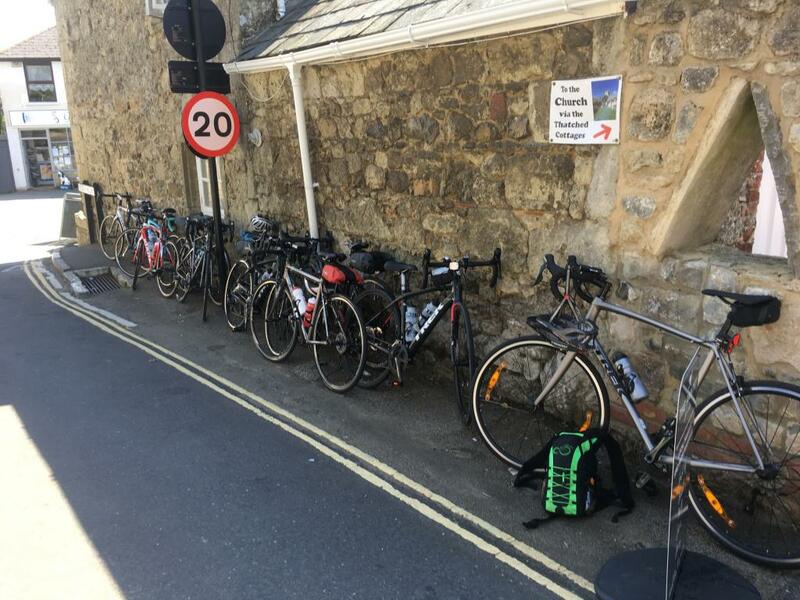 Although this is just over a 100km riding with just shy of 1400m of climbing, done at the right pace, this is a very accessible ride that takes in the best of the Isle of Wight. Glorious views, swooping hills and a ferry ride at Cowes (Ã�ï¿œÃ�Â£1), what more could you ask for . We will catch the 08:40 ferry from Lymington Pier (SO41 5SB). We will travel as day return foot passengers (Ã�Â£16.40 for adults and Ã�Â£12.30 for 60+, tickets can be bought online in advance or at the ticket office before sailing), bikes are carried free of charge. The crossing takes 40 minutes. There is a pay and display car park at the ferry terminal (Ã�Â£6.70 for 2-16hrs). Bring enough change for the machines or alternatively you can use Ringgo up to 3days before to pay for your ticket, see here http://www.wightlink.co.uk/go/isle-of-wight-ferry-routes-destinations/lymington-yarmouth-ferry/. You must arrive at least 30mins before the ferry to allow time for parking, buying tickets and boarding. Boarding commences 15 minutes before sailing. We will car share as much as possible. There is limited food on the ferry (tea, coffee, cakes, toast) but there is a cafe at the ferry terminal if you want to arrive early enough to grab some breakfast! We'll stop at the Old World Tea Rooms in Godshill for a late morning cuppa/comfort break. Lunch stop will be at the Toll Gate Cafe next to the harbour in Bembridge. We'll aim to stop for an afternoon tea/ice cream and comfort break at Cowes dependant on the time. Return ferry will either be the 17:05 or 18:05 from Yarmouth. I've provided last years route below, this may change in the coming month. 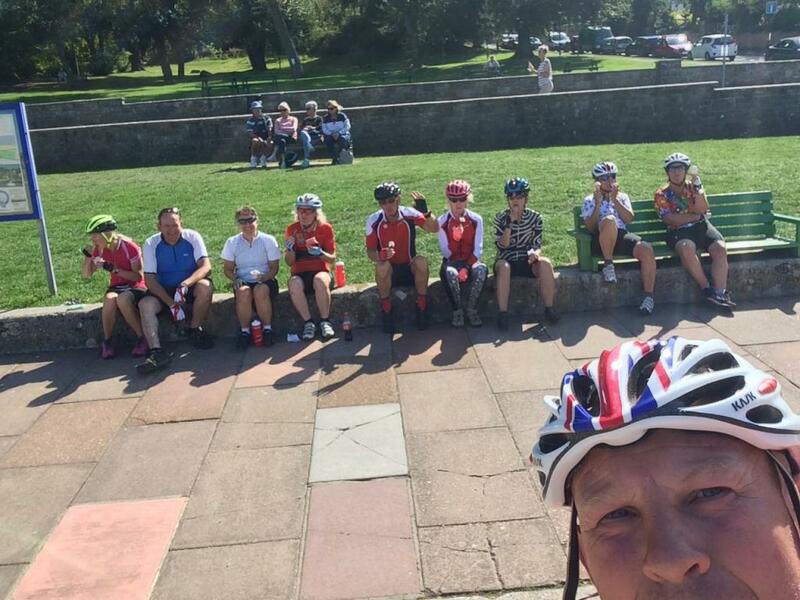 With 19 riders wanting to ride round the Island this year, we did 2 groups, this is the early group report and hopefully John Tranter (who led the later group) will report too (see second ride entry) . 11 of us assembled at the ferry, 8 of us having seen the sun rise over the Ridgeway and 3 cycling from stays in Lymington. There wasn't much traffic on the ferry and we soon were on our way - the early roller coaster to the stunning views of Allum Bay and Old Harry's Rock in Dorset. That set the tone for the day - beautiful views, fantastic tarmac, blue skies and a happy group. Not a peep about the niggling headwind or the steep initial climbs. The steepest climb at Black Gang Chime was conquered and then a glorious swoop and potter through the lovely little villages that are such a feature of the Isle of Wight. Being early we could not use the usual cafÃ© at Godshill, instead we found Worsleys - the consensus was this was even better than the normal place despite not being able to sit outside - excellent service and wonderful cakes . It seemed a very short hop to Bembridge and lunch - the views at the Tollgate CafÃ© as good as ever. There was even some paddling undertaken. With a short sharp climb straight after lunch, the legs were soon warmed up. The spectre of the A3055 struck again and Dave had a small mechanical, soon sorted. The Cowes Floating Bridge was running (unlike last Saturday when it broke down) and thanks to Sharon, we all had the right money ready. A lovely ice cream stop watching the boats on the Solent and then we were on the final stretch and reached the ferry with plenty of time - by going in to the port the wrong way, we got led to the right spot by an employee in a golf buggy - the Pied Piper of cyclists who luckily only led us to the ferry . Doing this ride after the Bank Holiday was very successful - far less traffic and quieter stops. Another great ride with a lovely, supportive group.